Each person in the workforce, regardless of occupation, age, or earnings shares a common goal: retirement. The irony of the situation is not lost on many people who realize that one of the most important goals a person can set when they enter the workforce is how they will save for the day they will exit the workforce. Think about that for a moment. Of course it is important to have other career goals. You don’t want to spend your entire adult life counting down the days until you no longer have to work. Nevertheless, retirement planning is essential to ensure you are able to live comfortably when the paychecks stop rolling in. Let’s look at some important factors that must be considered when you are planning for your retirement. If you haven’t yet begun the process of saving for retirement, you must start now. This is true for people in their early 20’s or people in their late 50’s. It is, of course, easier for younger people to save for retirement simple because they have more time to grow their money (compound interest is the most powerful force in the universe, after all!). A person in their early 20’s will have to save less per year to have the same amount or more money than a person who doesn’t start saving until their 30’s, 40’s or beyond. This is not to say that older people should give up on saving for retirement. That is definitely not the case as any savings efforts are worthwhile to ensure financial stability in your golden years. It does mean however that older individuals have no time to waste and must get started saving immediately. There are several different retirement plans available to individuals and couples today. Many of the popular plans like the 401k or IRA come with certain tax advantages. When saving for retirement it is important to understand how your savings will be taxed and when, to select the plan that best meets your needs. One way or the other, the government will expect their cut of your money, therefore it is better to be prepared and plan accordingly than be taken by surprise later. Roth IRAs are one of the best retirement planning options for investors because it gives them the power to control how and when they take their retirement withdrawals. Roth IRAs are similar to Traditional IRAs, however, they differ in one major aspect: how and when you investments are taxed. Traditional IRAs offer a tax break now – your contributions are not taxed when you make them, giving you a tax break now. However, your withdrawals in retirement years are taxed. 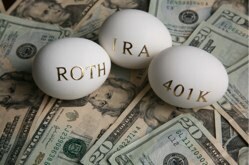 Roth IRAs follow the opposite pattern. Your contributions are made with income which has already been taxed, but your withdrawals are tax free. This gives you the opportunity to grow your next egg without the drag or threat of taxes, and it helps you better plan your retirement years. There is one more major consideration: Required Minimum Distributions. Traditional IRAs require investors to take a minimum withdrawal once they reach a certain age, regardless of whether or not they need the income. Roth IRAs don’t have such a provision. This makes it easier to plan retirement income. With the upheaval in the world of finances in the past few years, many people are feeling less inclined to risk their hard earned money in equities such as stocks and bonds. Unfortunately, letting your money languish in a savings account is not going to provide the growth opportunities necessary to retire in comfort. That being said, there is no need to risk it all in the hopes of coming out ahead. It is important for any individual with long term savings goals to review and consider all of the options available. If financial planning is not your strong point, you may want to enlist the help of a professional. However it is imperative you always remain in charge of your finances and aware of where your money is and the risks you assume. Retirement planning is a process that will undoubtedly change throughout your lifetime. If you have an end goal in mind as well as a plan to reach that goal, you are on the right track toward financial security in your later years. And a Roth IRA can help you get there in style.